The secret to being a successful blogger is to be always writing things that can benefit others. A good blogger should see a problem and then show you how to fix it. I wish I was that blogger. Anxiety has slowly been taking over my life to the point that now it has nearly crippled me. I’m not leaving the house, seeing friends or going to work. Bills are mounting up, and with them, more anxiety. Many of you will relate to this crippling form of anxiety, and I am sorry for each and every one of you. Disclaimer: I am not a mental health professional. This blog contains my own personal experiences of living with mental and chronic illness. If you think you or a loved one are dealing with a mental disorder, please promptly seek the appropriate medical attention. It all started about two months ago. I went to my primary care doctor for a follow-up and to get my next prescription refills. One of the topics of our session was to discuss the increased amount of pain I was suffering from my Familial Mediterranean Fever (FMF). For whatever reason, my doctor decided that the cause of the pain was from the bipolar meds not working. So we started a new treatment – a new drug to add to the cocktail. Anxiety has been a constant companion to me my entire life. I do not remember a time without it. There are times when I’ve been able to wrangle the enemy and live a relatively normal life. The new medicine changed all that. At the last two visits, I spoke to my primary care doctor about the increase in anxiety. His takeaway was that I needed more of the medicine. The anxiety has been becoming more and more strangling. First, I was having a harder time driving or leaving the house. Then, conversations became more and more difficult. Next, at Bible Study a couple of weeks ago, I was asked to read a passage out loud. A few sentences in and I couldn’t breathe. I had to stop reading and leave the study. So, against the doctor’s orders, I stopped the medicine a couple days ago. It’s only been a couple days, so I don’t really feel like myself yet. However, I am starting to feel better. My blood pressure is returning to normal, which is usually a good sign that I am getting through the worst of it. Is everyone else that way? Does anxiety raise your blood pressure? I would honestly like to know. My blood pressure is usually a perfect 120/80. 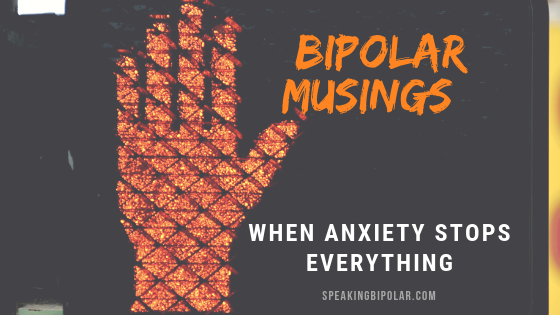 However, when anxiety starts getting in the way or my thoughts start running away from me with the worst possible what-ifs, then my blood pressure always starts going up with it. So, the fact that my blood pressure was normal today leads me to believe that the medicine was indeed the problem. Not familiar with anxiety? Read this post about what an anxiety attack feels like. Since it’s been a couple months that the anxiety has been reigning supreme, things have gotten a little out of control. Things inside my house and in the yard are a disaster. Friends have heard little from me in weeks. Work has been near nonexistent. This is where I wish I was that blogger that had the answers. I see the problem. I know and live the problem, but the solution escapes me. I know my doctor will want to throw more medication at the problem. That both intimidates and frightens me, but I will not give up. I have been at this rodeo for a long time, and now is not the time to quit. If there is anything I can offer to you, dear reader, is the same advice. Tomorrow the sun will come up. Better days will come for both of us. I can definitely relate. I see other bloggers and wish that I can be as diligent and motivated as they are. But I simply can’t. Mental illness cripples me when I become too overwhelmed at the thought of accomplishing some of the things that need to be done in order to run a successful blog. So, I just accept it. I write when I can, comment when I can, and leave the rest to God. I feel that if I’m meant to an awesome, well-known writer, then it will happen. Otherwise, I try not to stress over it. Thank you for taking the time to comment. I appreciate the validation. Leaving it with God is always the best solution. Keep writing! It is always my pleasure! I hope you are having a wonderful day. Its always my pleasure. Thank you for kind words. I pray you are having a wonderful day.